I had the privilege of sitting in on a round-table discussion led by the ‘Go West Project‘ at the Chengdu Biennale this past weekend. Go West Project is an independent think-thank based in Shanghai founded by two Dutch nationals, Michiel Hulshof, a journalist, and Daan Roggeveen, an architect. For the past two years, Hulshof and Roggeveen traveled around the country documenting the phenomenon of urbanization in China’s lesser-known cities (hence the name ‘Go West‘). 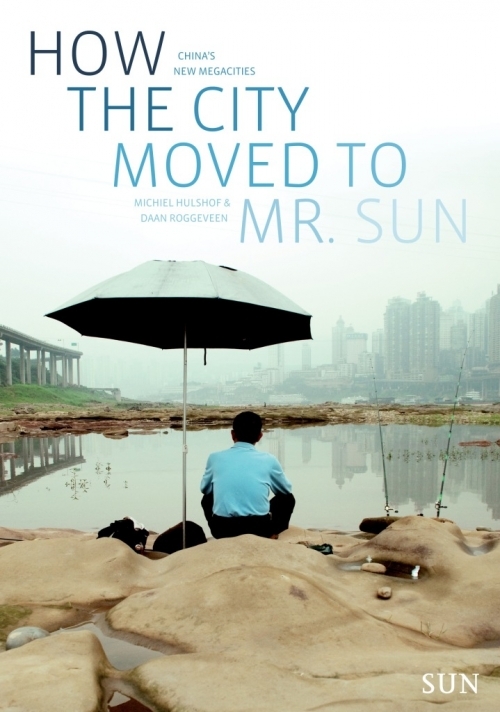 Their research culminated in a recently released book titled How the City Moved to Mr. Sun. The title refers to one of the several personal narratives they encountered in their travels. Mr. Sun, a corn farmer in a village on the outskirts of Shijiazhuang, capital of Hebei Province, saw his land seized by authorities nearly 20 years ago. Like many of the other villagers, he used the compensation money to develop his own 4-storey ‘mixed-use’ building complete with retail space on the ground floor, living space on the 2nd and 3rd floors and a small group of guestrooms for migrant workers on the 4th floor. On the roof, Mr. Sun created an organic garden to continue doing what he knew how to do best. Inevitably, the pace of urbanization caught up to Mr. Sun once again, and after about a 10 year run of profitability, his self-developed building was razed by bulldozers. He reluctantly gave in and accepted compensation and now lives with his wife in a modern high-rise residential tower block where ‘he doesn’t know any of the neighbors’. Mr. Sun’s story is one of several Hulshof and Roggeveen document in their book. In addition to Shijiazhuang, they visit 12 other cities in China’s interior including Zhengzhou, Wuhan, Chongqing, Hohhot and Kashgar, among others. Each city focuses on a different aspect of urbanization in China, and in Chengdu they chose to focus on cultural development. And cultural development in Chengdu is what we focused on at the Biennale discussion. Hulshof and Roggeveen were interested in hearing from the people in attendance, mostly artists, designers and musicians from Chengdu’s local arts scene, what they thought of promoting ‘special arts zones’. As preposterous as this idea sounds, given that artists typically establish themselves from the ‘bottom-up’, China has already established designated arts zones throughout various cities in China. This is perhaps no surprise as China’s approach to development in virtually every sphere comes from the ‘top-down’. As a matter of fact, the Chengdu Biennale coincides with the opening up of the new East Music Park, a re-used industrial zone that is also the site of the event. Spearheaded by the local government, the East Music Park is a new area full of bars, clubs, restaurants and gallery space intended to promote the arts in Chengdu. Of course, the profit motive behind the creation of such arts districts is not hidden. Yet regardless of this commercial aspect, most Chinese artists agree that anytime the government is on board to promote culture it is a positive thing. China’s top-down development model excels at creating the ‘hardware’ of cities: roads, bridges, public transit, buildings, etc…but when it comes to the development of ‘software,’ or the cultural side of cities, governments have a harder time of deciding the best route to take. That is why in the case of Chengdu, the local government looked to the artists themselves for consultation on how to proceed. In their book, Hulshof and Roggeveen mention the story of local painter Luo Fahui, once a renegade who had to move around the country to avoid run-ins with government authorities, who later was literally given free gallery space developed by the local government to pursue his artwork. Change of fortune indeed. As China’s development model continues to evolve, the ‘software’ of cities becomes increasingly important. And as more Chinese citizens realize that there is more to life than the acquisition of money, they will demand more ‘meaningful’ experiences, including patronage of the arts. This is the conclusion we reached at the Biennale round-table and the conclusion Hulshof and Roggeveen reached after their travels around China. China is at a crossroads now. Next year will see a nationwide change in leadership and with analysts predicting the end to China’s growth model, the country is looking to new ways to continue economic evolution. That is why Hulshof and Roggeveen’s work is timely. To see where China is, and where it is going, I highly recommend their book.